We commemorate each of our sisters’ death anniversaries with special prayer intentions for that sister. Today, we remember and honor our foundress, Mother Gertrude Leupi. 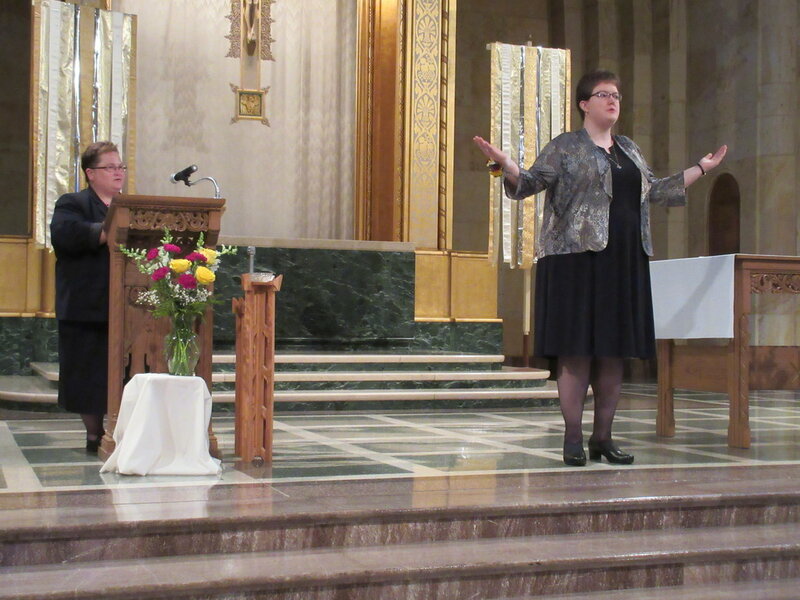 Her courage lead her to follow Bishop Martin Marty’s invitation to service. Leaving the Swiss Alps of Maria Rickenbach convent for the windswept plains of the Dakota Territory. She was the first prioress of Sacred Heart Convent and led our early sisters from 1880-1891. As foundress of our community, Mother Gertrude Leupi, had a great love for solitude and prayer. She came to America in 1880 at the age of 55 with 21 years’ experience as Prioress. “An Abbess who is worthy to be over a monastery should always remember what she is called, and live up to the name of Superior. For she is believed to hold the place of Christ in the monastery, being called by a name of His, which is taken from the words of the Apostle: “You have received a Spirit of adoption …, by virtue of which we cry, ‘Abba — Father'”! Therefore the Abbess ought not to teach or ordain or command anything which is against the Lord’s precepts; on the contrary, her commands and her teaching should be a leaven of divine justice kneaded into the minds of her disciples” (Rule of Benedict 2). Mother Gertrude was also foundress of two other communities. In all her years of being Benedictine, she always shared true concern for the spiritual and physical needs of her sisters. On March 26, 1904 at the age of 80, the Lord called her home, rewarding her for all her efforts to spread His message of spirituality. Eternal rest grant unto to her O Lord, and let perpetual light shine upon her. Mother Gertrude Leupi was born on March 1, 1825. 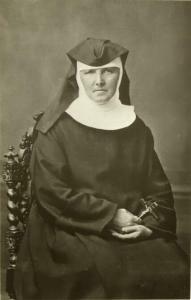 She professed her Benedictine vows on March 21, 1848 and lived 25 years at the convent of Maria Rickenbach in the Swiss Alps. She then served in North America for 12 years as a foundress and superior of new Benedictine convents. 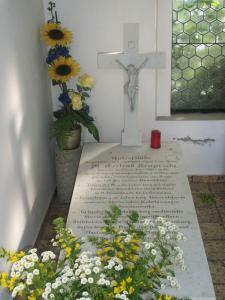 She then returned to Switzerland, founded the Marienburg convent and later died March 27 (26), 1904. The communal prayer of the Liturgy of the Hours is the hub around which a Benedictine community turns. Of the 73 chapters in Saint Benedict’s Rule, over a dozen focus on the structure of prayer, outlining the times for prayer, as well as the format and Psalms that should be used. Several more of the chapters continue to add recommendations that illustrate the nature of our prayer, calling us to an openness and reverence as we approach both the Liturgy of the Hours and private prayer. Benedict denotes when the bells should be rung, who should lead prayer, even suggesting how the community should be arranged in the oratory. What Benedict doesn’t mention is how the oratory itself should be designed. The closest he comes to such a comment is at the beginning of his chapter “On the Oratory of the Monastery”, his Rule states, “Let the oratory be what it is called, a place of prayer; and let nothing else be done there or kept there” (Rule of Benedict 52: 1). If you have visited any variety of Benedictine monasteries or abbeys, you will likely feel a commonality in their oratories and chapels. The spaces will all be different in design and material, but within them, you will feel a similar simplicity, warmth, and focus on the community that prays within it. Benedict may not describe how he wants an oratory to be built, but he sets the tone or environment of the space through the communal nature of his Rule, focus on simplicity, and reminder that “[he should] regard all the utensils of the monastery and its whole property as if they were the sacred vessels of the altar. Let him not think that he may neglect anything” (chapter 31). Our Peace Chapel where we celebrate our daily Liturgy of the Hours is simply arranged around the altar in a half-circle where the sisters can easily see each other during our prayer and bring that focus to Christ in the Eucharist. However, one wall is set aside for décor that reflects the Church seasons. During the brief Ordinary interlude between Christmas and Lent, the face of Christ gazed out at our community. “The image is a close-up of the face of Christ from a 13th century mosaic in the Hagia Sophia (Holy Wisdom) in Istanbul, Turkey. Built in 360AD, the Hagia Sophia, originally a cathedral, is generally considered one of the best examples of Byzantine art and architecture in the world. Over the centuries, various works of art were added to the Cathedral. The original 13th century mosaic is a common depiction in Eastern Christian iconography of Christ flanked by the Virgin Mary and John the Baptist” (Sr. Marielle). Unable to print or create an entire icon of the mosaic art, Sister Marielle collaborated with one of our workmen to create a display. 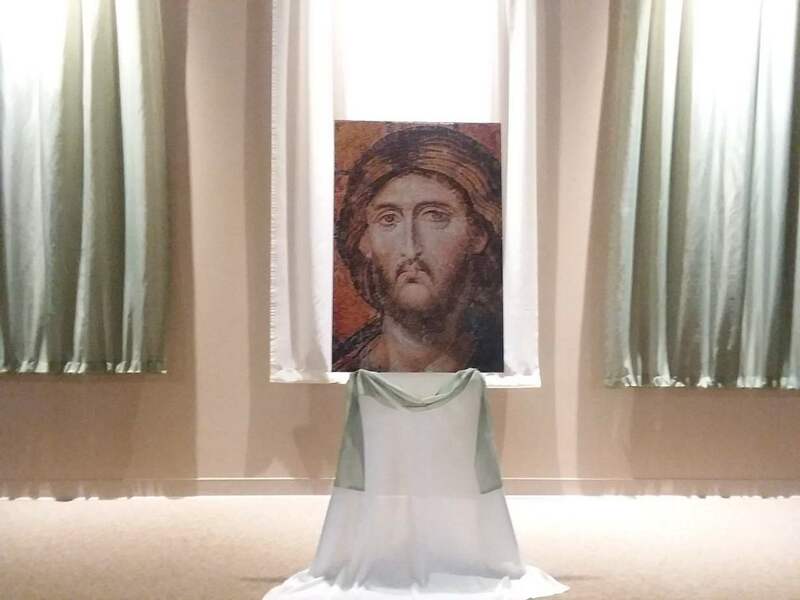 While Sister planned out where to find large poster art of details from the icon, the workman designed a simple display of masonite backing and plexiglass. He also created a clever clip system to hold it all together on a sturdy tripod. Now that we have a reverent way to display the art, our artist and liturgy sisters are on the search for more prints of sacred art, details from major icons, and plans for the future, including an image of the Blessed Mother for major Marian feasts as well as those key months of May and October. Curious about our ‘accent’ wall calling us to deeper prayer? Join us in the Peace Chapel for Liturgy of the Hours or daily Mass…we’ll save a chair for you. Join us in praying for Catholic Sisters and Nuns who continue to seek God’s Will and serve God’s people throughout our nation. Pray also for women who continue to discern God’s will in their lives. During her mother’s illness, she boarded with the Benedictine Sisters at St. Joseph’s School in York. After completing elementary and high school at St. Joseph’s, she entered Sacred Heart Monastery in 1956. She made her First Profession in 1958 and Perpetual Profession in 1961. Sr. Mary Carole began her education with a BA and then MA in mathematics, and her ministries in included teaching at elementary, secondary, and even college levels. Sister then returned to school for her PhD in psychology and began her ministry as a therapist and counselor. “I am a life-long learner and took advantage of every educational opportunity that was available. I am very fond of traveling and have had numerous opportunities to see the world.” Participating in three Diocesan pilgrimages and traveling to Ghana with her missionary cousin, Fr. Bill, are noted as favorite travels and memories. to live lives dedicated to prayer and loving service. and continuing signs of Your presence in our world. to welcome and to serve all Your people without hesitation or pause. consecrated celibacy, and committed obedience to Your will. who showed these dedicated women the way to living in union with You. Amen. 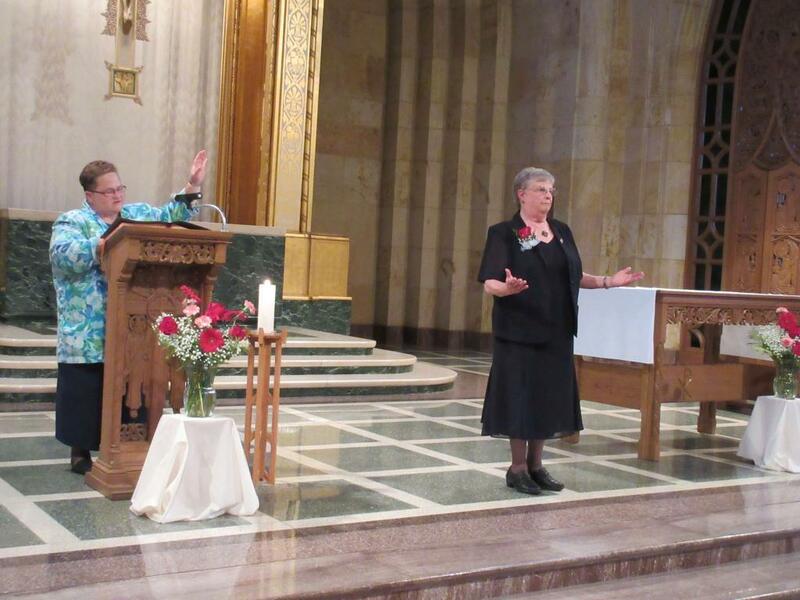 Sister Peggy was raised in Pierce, NE, and was baptized at St. Joseph’s Catholic Church. 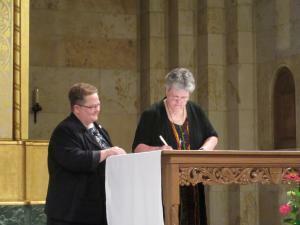 She received her Bachelor of Science in Nursing from Mount Marty College and was employed at Faith Regional Health Services in Norfolk for several before entering the Monastery in 2012. Sr. Terry is from Philadelphia, PA, and is the third of eight children in her family. While serving as an Assistant Professor of Theology at Mount Marty College, Terry began studying the life of our Benedictine community next door to the college, this led to her decision to join the Monastery. 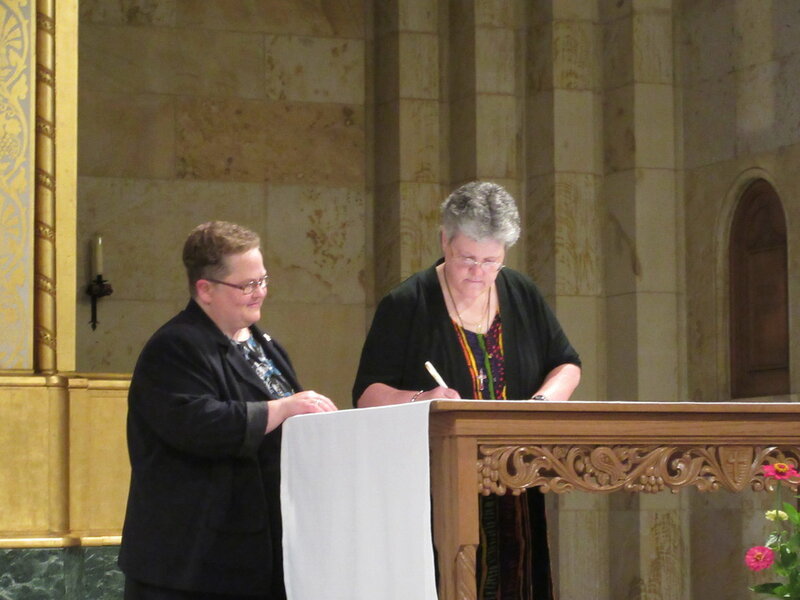 During Saturday Vespers on August 4th, Sister Terry made her First Profession in the presence of Sister Maribeth, Prioress, and her Benedictine Sisters. 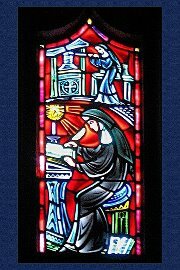 She promised to live our Monastic Life of obedience, stability, and conversion of life according to the Rule of St. Benedict. Her family joined the Sisters in our joyful celebration of her First Profession. SHM Volunteer Program | Join us in ministry! Come and explore our incredible setting as a Resident Volunteer! Our weekday schedule at the Monastery. The weekend horarium allows for a reflective start to the day. You call us to live in your love through the grace of our baptism. Bless us with the courage to carry out the mission of Jesus. the diaconate, priesthood, and the consecrated life. Pope Francis said, “The Eucharist affects the way we see others. In his life, Christ manifested his love by being with people, and by sharing their desires and problems. So, too, the Eucharist brings us together with others–young and old, poor and affluent, neighbors and visitors. The Eucharist calls us to see all of them as our brothers and sisters, and to see in them the face of Christ.” ~ February 14, 2014 General Audience.